With the “Verticale di Piave PDO” we offer a complete tasting of all the maturing times of Piave PDO, from the Fresco, matured for 20 days, to the Riserva, matured for over 18 months. With the “Verticale di Piave PDO” we offer a complete tasting of all the maturing times of Piave PDO, from the Fresco, matured for 20 days, to the Riserva, matured for over 18 months, accompanied by a trio of sweet-hot sauces. This is all contained in a strong, elegant red box. 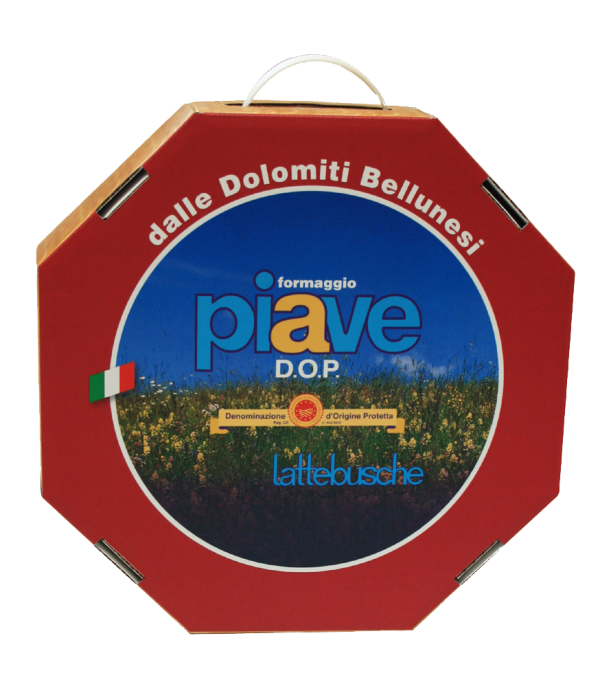 Piave PDO Fresco Cheese (1/4 wheel). Matured for 20 to 60 days; it is mild and milky to the palate, with yoghurty notes. It is very good as table cheese or as ingredient for rolls, in combination with local salami and cold pork meat. Piave PDO Mezzano Cheese (1 kg). Matured for 60 to 180 days. It has a mild and fragrant flavour that is not too salty; its fragrance is clearly reminiscent of milk and yoghurt. It is further enhanced if accompanied by sweet and delicate tasting preserves. Piave PDO Vecchio Cheese (1 kg). As the maturing time proceeds (over 180 days) the Piave PDO cheese becomes more crumbly and its flavour more intense and fruity. Piave PDO Vecchio Selezione Oro Cheese (1 kg). A maturing time of over 12 months gives the Piave PDO cheese a full flavour, with hints of walnut, that lingers on the palate. Its aromatic notes, resulting from the richness of the mountain milk with which it is produced, make it unmistakeable.